Casino blackjack 21 with a twist!! Cheat and play against cheaters to win cash. Cheaters blackjack updates the classic casino gambling game with cheating, wild west type showdowns, 6 game modes and worldwide hi-score leaderboards. 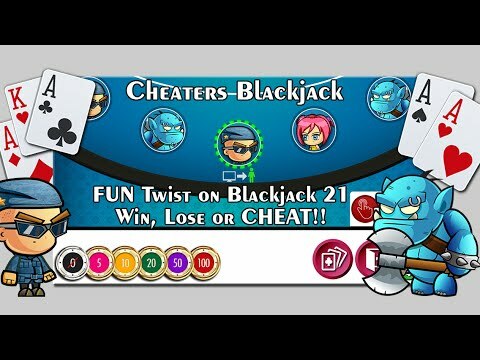 Cheaters blackjack 21 adds the 'cheating' twist to the classic gambling game. Cheating steals the next card in the deck and swaps it with the worst card in your hand *if* it improves your hand. Play against cheating CPU opponents to win match play and compare your scores to other player worldwide!! Catch CPU players to prevent them from cheating to gain advantage. Cheat to improve your hand and chances of winning but if the CPU players catch you cheating it could spell trouble since they can challenge you in a old west type showdown for cash. Good luck!! NOTE: *Internet access may be required. This application contains optional video advertisements that can be viewed to provide you additional rewards. Additional data charges may apply if roaming or not connected to Wi-fi.